Interstate 196 provides a regional connection in part with Interstate 94 from the Chicagoland area and Michiana north to Grand Rapids and Muskegon along the east shore of Lake Michigan. Named after Gerald R. Ford, the freeway honors the 38th President of the U.S. 2016 MDOT traffic counts along I-196 peak at 89,600 vehicles per day (vpd) north of Downtown Grand Rapids. 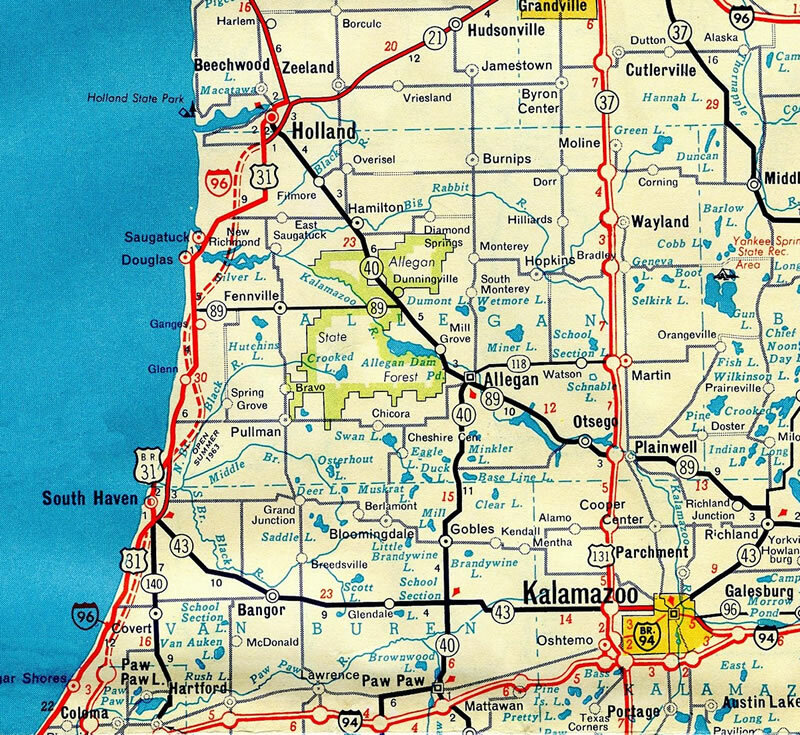 With 20,915 vpd, the least traveled section of I-196 is the segment between Exits 13 and 18 near South Haven. Doubling as U.S. 31, I-196 branches north from I-94 in a rural area outside the city of Benton Harbor. The two cross the Paw Paw River en route to Lake Michigan Beach, where they begin mirroring Lake Michigan coastline north into Van Buren County. Heading north to Van Buren State Park, Interstate 196 & U.S. 31 travel just inland from the lake along a rural course populated by forested hills. Approaching the city of South Haven, the first of three business routes from I-196 separates with the freeway. I-196 bypasses the city of 4,400 to the east, while Business Loop I-196 forms an L-shaped route to the city center. Crossing into Allegan County, I-196 & U.S. 31 resume a rural course and shift slightly further east before nearing the lake shore again near Saugatuck. Turning east to bypass the small city, the freeway crosses the Kalamazoo River adjacent to Douglas Bayou as I-196 begins to trend northeast toward Grand Rapids. U.S. 31 separates from Interstate 196 at Holland, initially traveling an expressway along side Business Loop I-196. I-196 skirts the south side of Holland and the adjacent city of Zeeland to Exit 55, where Business Loop I-196 returns. A rural stretch ensues from there leading to Hudsonville and the Grand Rapids metropolitan area. 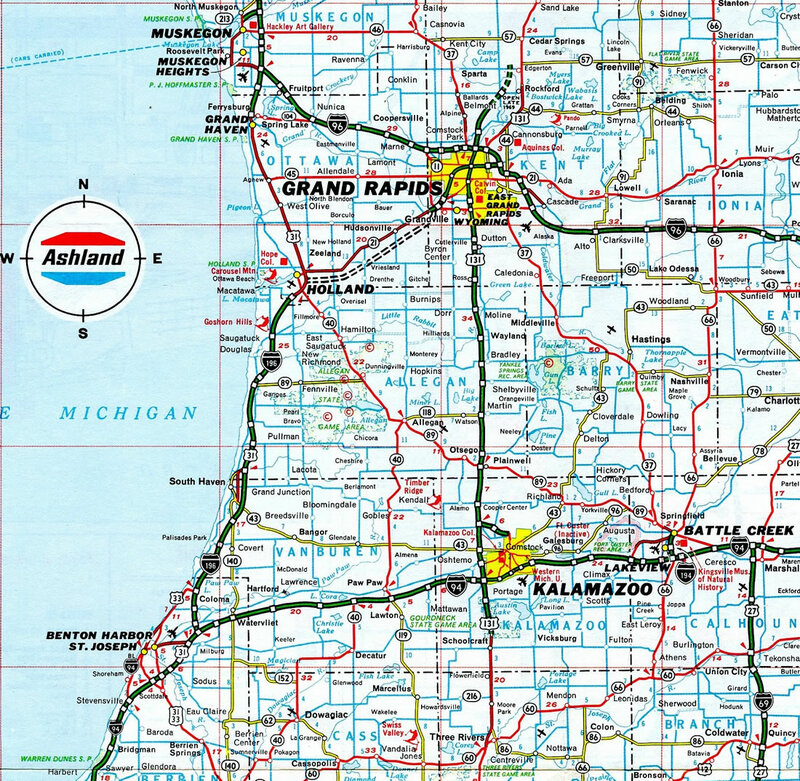 M-6 constitutes a freeway bypass south of Grand Rapids by way of Cutlerville and Gainesville Township to Interstate 96 leading east to Lansing. I-196 meanwhile curves northward into Kent County through urban areas of Grandville, Wyoming and the west side of Grand Rapids. A directional interchange where the roadways of U.S. 131 switch sides, connects the north-south freeway with Interstate 196 at its second crossing of the Grand River. The remainder of the freeway east passes through Downtown en route to its end at Interstate 96. Prior to the designation swap of Interstates 96 and 196, I-96 west defaulted onto I-196 west. Initial construction of Interstate 196 (then I-96) along the east shore of Lake Michigan in 1963. Curving northwest along Interstate 96 ahead of ramps from M-21 west and to M-44 and M-37, motorists passed under this diagrammatic sign for the westbound split of Interstates 96 and 196 (Exit 37) in two miles. This assembly was replaced by 2011 with an arrow per lane (APL) sign. The APL sign was missing by 2014, and a new panel without any arrows was installed by 2015. Photo taken 11/05/09. 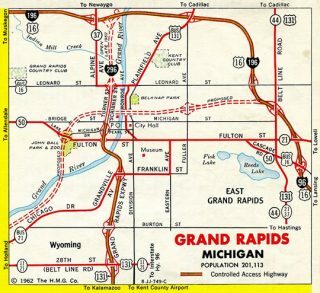 Two lanes partition for both Interstate 196 (Gerald R. Ford Freeway) west to Downtown Grand Rapids and the continuation of Interstate 96 west & M-37 north to Comstock Park and Muskegon. New signs added here include an exit only placard for the left-hand ramp to I-196. Photo taken 11/05/11. The previous set of guide signs posted at the separation of Interstate 96 and 196 westbound. Holland was dropped as a control city for I-96 by 2015. Photo taken by Eric W. Vander Yacht (04/01). Paralleling Oak industrial Drive and the Grand Rapids Eastern Railroad, Interstate 196 defaults onto Interstate 96 east from Fuller Avenue (Exit 79). Photo taken 11/05/09. The merge with Interstate 196 expands I-96 east to four overall lanes to the adjacent parclo A2 interchange (Exit 38) with the departing M-37 south and M-44 (East Belt Line Avenue). Photo taken 11/05/09. Interstate 196 east concludes at a wye interchange with Interstate 96. Photo taken 11/05/09. Interstate 196 leads due south from a parclo A2 interchange (Exit 1) with Red Arrow Highway to Interstate 94 in three quarters of a mile. Photo taken 11/05/11. Traffic separates into dual lane ramps for Interstate 94 west & U.S. 31 south to Benton Harbor and Interstate 94 east to Kalamazoo. The unconstructed U.S. 31 link south to Niles and South Bend, Indiana is proposed to tie in here. Guide signs here for the I-94 were replaced to use Clearview font by 2012. Photo taken 11/05/11. An end shield for Interstate 196 precedes the trumpet interchange with I-94. Photo taken 11/05/11. With traffic added from I-196 & U.S. 31 south, 2016 counts recorded by MDOT along Interstate 94 increased from 38,038 vpd east of the merge to 61,700 vpd after it. Leading away from Benton Harbor, I-94 continues west to Michigan City and Gary, Indiana and Chicago. U.S. 31 heads south ultimately to Indianapolis. Photo taken 11/05/11. Interstate 94 & U.S. 31 combine from Napier Avenue (Exit 30) north to Interstate 196 (Exit 34). A long term proposal to connect the U.S. 31 freeway north from Berrian Springs to I-196 directly remains uncertain, due to environmental impacts. The two mile guide sign for I-196 at the Empire Avenue overpass here was replaced to use Clearview font by 2015. Photo taken 11/05/09. One mile ahead of the trumpet interchange (Exit 34) with Interstate 196 and the northbound split with U.S. 31 on I-94 east. Highland Avenue spans the freeway here, followed by the east end of the Benton Harbor business loop for Interstate 94. Photo taken 11/05/09. Interstate 94 east & U.S. 31 north cross over Blue Creek and below Benton Center Road just ahead of the ramp departure (Exit 34) for Interstate 196 north. I-196 runs north along Lake Michigan to South Haven, Douglas and Saugatuck. Bridge repainting in late 2011 led to the replacement of this overhead. Photo taken 11/05/09. U.S. 31 accompanies Interstate 196 north for 45 miles to Holland and Business Loop I-196. 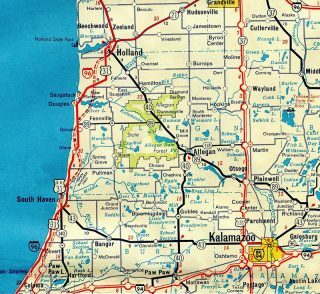 The US highway varies between a four-lane divided highway or freeway northward to Muskegon and Ludington. 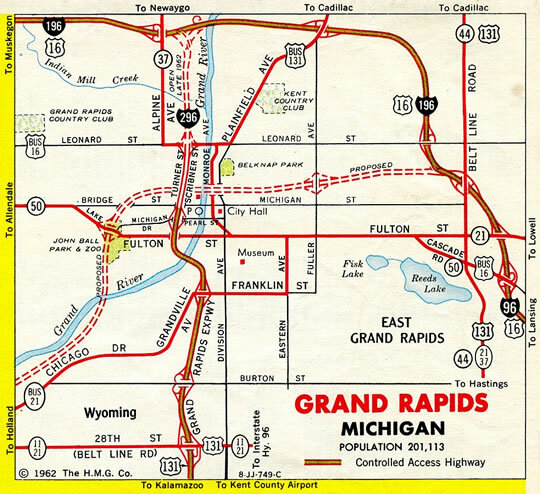 I-196 turns east from the split with U.S. 31 to Zeeland and Grand Rapids. Photo taken 11/05/09. The first shield confirming marker for Interstate 196 was posted along the eastbound off-ramp (Exit 34) from I-94. It was removed by 2011. Photo taken by Jeff Morrison (06/24/07). Stephen Summers’s Interstate system route numbering, former web site. Michigan Highways: Highways 180 through 199. Page updated August 3, 2017.